When planning mining housing for your onsite workforce, flexibility is an important consideration. You want options that can grow with your operation. Portable shipping container homes are a great choice—not only because they’re so easy to transport and set up, but because they allow for custom modifications. While you could spend time and money to build multi-story, customized work camp housing, there’s an easier way to get the job done. Why pay for the extra labor and materials when you could have ready-made living quarters shipped in and installed? 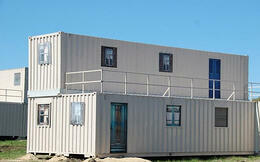 Portable storage buildings and shipping container homes are often the ideal fit. The layout of your camp should be a big consideration. In mining areas, your space for a work camp may be limited. In addition, you may want navigable space to be used conservatively, to make the camp more functional for foot traffic and equipment transport. To combat space and layout issues, steel shipping containers can be joined and stacked, allowing the same amount of housing, administration, and storage space to exist inside a smaller perimeter. A remote work camp serves as much more than just a place for your employees to sleep at night. When you are hours away from the nearest town, your workers rely on mining housing for food, hygiene, basic health care, socialization, and entertainment. Your goal is to fulfill all of those needs while keeping your camp as efficient and affordable as possible. These features make portable shipping containers a sensible solution for housing and storage in a wide variety of climates and environments. By working with an expert team—like our engineers and designers at Falcon—you can quickly decide which features will support your project. And you won’t have to worry about extreme weather affecting your onsite camp. To learn more about portable storage buildings for your work camp, give us a call at 877-704-0177.